Liz Shumpes is a wife of 37 years, mom, grandmother, realtor, lover of red wine and all things dark chocolate. She’s a self-trained home cook who LOVES to cook and entertain in her home in the beautiful Texas Hill Country. Liz began her blog, What’s for Dinner? https://lizskitchen.wordpress.com as a way of passing along her recipes to her children and friends. She tries to use fresh, in-season, organic ingredients and her philosophy is “Moderation is Key,” although for those times when you want to indulge a little, Liz has recipes for that as well. 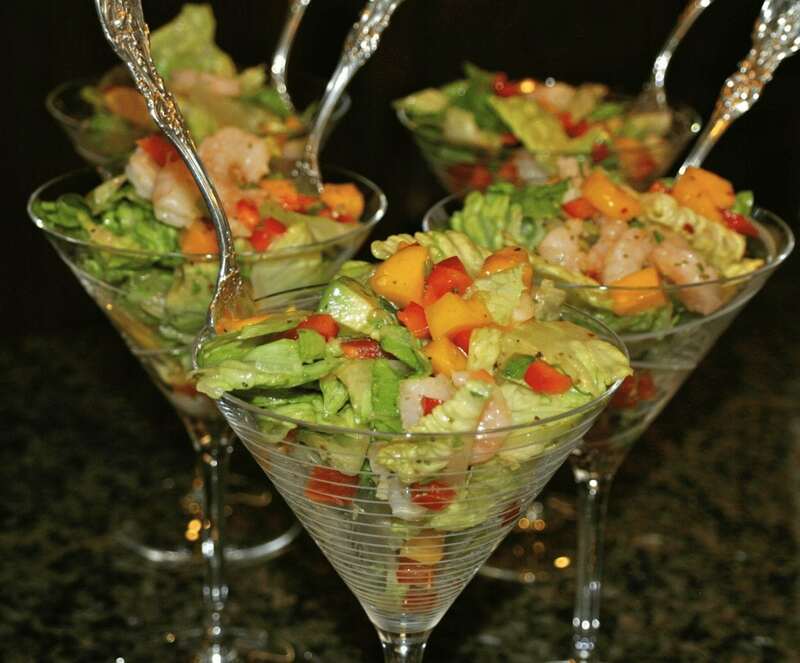 This recipe works great as a main meal, plus it uses one of my favorite fruits: mango! You have the sweetness from the mango, a bit of spicy from both the red and black pepper and the creaminess from the avocado. If you decide to serve this as a first course, try it in a martini glass for a touch of elegance! I think shrimp is more flavorful if roasted in the oven rather than boiled in water. Just toss the shrimp with a few tablespoons of olive oil and 1/2 teaspoon each of salt and pepper. Lay them in a single layer on a sheet pan and roast for 8-10 minutes at 400° or until they’re just pink, firm and cooked through. Set aside to cool, then add to your salad. I found the original recipe in Cooking Light Magazine. Enjoy! Place Mango Vinaigrette in a large bowl. Add lettuce, bell pepper and green onions. Toss well. Add shrimp and avocado. Toss gently. Combine first 8 ingredients, stirring with a whisk. Stir in mango.